Our 9 inch plastic borders are a great solution for retaining protective playground surfacing in any location. They’re 4 feet long, 9 inches tall, and 4 inches thick. They’re made from sturdy roto-molded plastic, meaning that they’re hollow inside, but they have ribbing inside for additional strength. Each plastic border comes with a steel stake. These borders are easy to install, requiring only a sledgehammer or even a heavy mallet. In terms of their height, please note that the U.S. Consumer Product Safety Commission (CPSC) and the ASTM International Standards both call for 9 inches of playground surfacing. Purchasing a 9-inch border may not necessarily provide sufficient height to do this. If you have any doubts, please take a look at our 12-inch plastic borders. Plastic borders are a great way to create visually distinctive borders for landscaping, playground materials, and other types of surfacing. Our plastic borders have no splinters or preservative chemicals, unlike wooden borders. They’re easy to install — you don’t need any expertise or special tools to put them in. Our black plastic borders are manufactured from 100% recycled plastic. Fitting plastic borders together is easy. The ends of the plastic borders overlap, and they are fastened in place with a galvanized spike. Just line the plastic borders up where you want them to go, drive the spike into the ground using a mallet or sledgehammer, and your job is done. 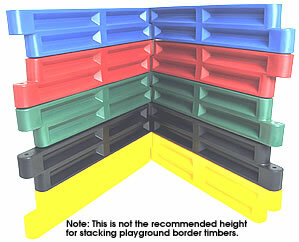 The 4-foot long, 9 inch high plastic borders come in the following colors: black, green, red, blue, and yellow. These plastic borders are 52 inches long from end to end (48 inches when installed and overlapping). Their width is 4 inches. Height is 9 inches. These plastic borders are manufactured from polyethylene, and they have ribs molded-in for strength. This design makes them very sturdy. The borders are hollow, not solid, weighing only 9 lbs. Bulk purchases of orders of 20+ timbers may be eligible for discounts. Our pricing includes the vertical spike with each plastic border (1 per border), but not shipping. Please also note that the design of the borders may be slightly different than designs shown above. Please note that certain colors may require custom production runs, increasing the availability time.